Family Outreach Community Center hosted a volunteer appreciation dinner April 17th at the American Legion in Stronghust. FOCC acknowledged 20 of their most committed volunteers of 2015 with a dinner and awards ceremony. Fern Fude was one of many to receive an award at this event. Fern Fude was given the "Volunteer of the Year" award and was acknowledged for her passionate volunteer work at the Family Outreach Community Center. Fern worked a total of 254 documented hours in the year of 2014. 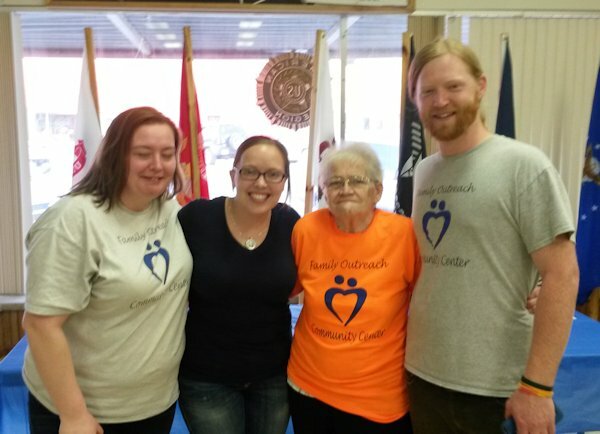 The volunteers at Family Outreach Community Center worked a total of 1,317 hours in 2014. Those acknowledged at the event were: Melissa McIntire, Debbie Gillam, Amy Booker-Hirsch, Fern Fude, Sharon Venardi, Joan Cupps, Norma Harden, Justin Allaman, Kellsy Scott, Carol Sprock, Janean Crandall, Betty Grau, Kimberly Mettler, Satya Leonard, Loraine Peterson, Bill Kent, Danny Dickenson, Jean Steck, Rod Nichols, Quentin Peterson, Pat Peterson, Angie Torrance, and Ann Wetzel.